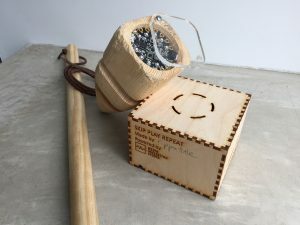 ‘Skip Play Repeat’ is a playful and participatory artwork commissioned by Mirador Arts for ‘Walking In Other’s Footsteps’. The project is a response to the Elizabeth Roberts Working Class Oral History Archive, one of the most important collections of oral history testimonies of working class life in north west England. 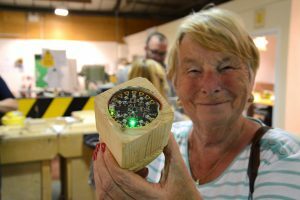 Mirador Arts commissioned three artists to create works in Barrow, Lancaster and Preston where Dr Roberts made her original recordings in the 1960s of working class people born between 1890-1940. 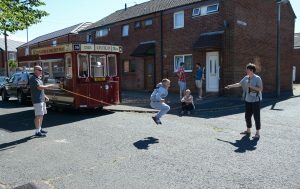 ‘Skip Play Repeat’ took place in Preston and included making, digital technology, community participation and street play. During the late 19th century, Preston was a thriving cotton town renowned for its yarn and cloth. Hundreds of mills sprung up to service a global demand for cloth as did streets of terraced housing to accommodate the mill workers. Families lived cheek-by-jowl with industry, with generations being employed in the mills, which were noisy and dangerous. The living accommodation was dense and highly populated and conditions were often cramped and uncomfortable. Despite the hardship at work and home, families looked out for one another and there was a deep sense of community. Childhood in Preston was brief with children’s education being cut short at the age of 11-12 years old when they were sent to work in the mills. Younger children were often left to fend for themselves during the daytime whilst parents went out to work. Due to the cramped living conditions, children spent a lot of time playing out on the streets in all seasons. 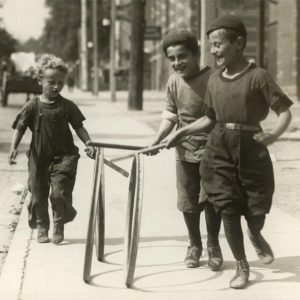 Money was scarce so they made their own toys and games with Niggin-In, Weep, tops and whips, skipping ropes and lamppost swings all being popular. 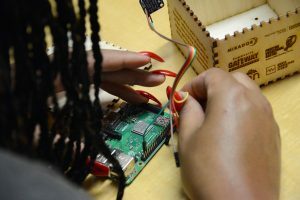 This seems a far cry from contemporary life as it was reported last year that today’s children currently spend more time indoors that inmates in prison. Fear of strangers, traffic or accidents and lack of time due to busy school and work schedules have seen playing out disappear from our streets. ‘Play, Skip, Repeat’ addresses these issues by working with the residents of the Preston. 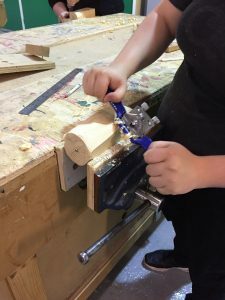 Together we recreated toys that children would have made and played with at the turn of the last century using traditional techniques. However, when the toys are played with, the motion generates stories of people from the archive talking about play. 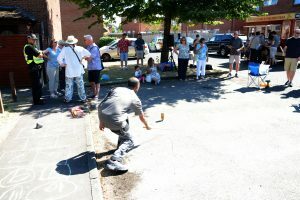 The project culminated in a one-day event where everyone played out together with the toys and join in other street games played in the past. 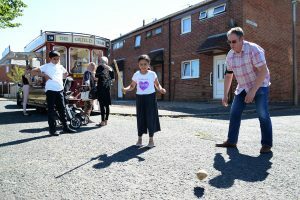 The aim of the project was to reconnect residents with their past and with each other through the archive. 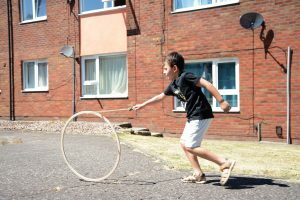 The title of the work ‘Skip Play Repeat’ refers to the physical actions of street play but also to the commands in digital gaming to question how children play today.